This is from the Agenda part of the magazine, where we have reports and comments on news stories. Italians (and everyone else) often think their politicians are a group of clowns. Now they have elected a real clown, the comedian Beppe Grillo (in the picture), as an important person in the future of their politics. He is 64 years old, he does not look smart, and he has almost been banned from Italian TV because he often criticises Italy’s politicians. In his 2013 election campaign, he organised very big meetings in the squares of Italian cities where he talked about how bad the politicians are. He said their stealing and corruption is the reason for the economic problems and cuts in Italy. It was amazing. 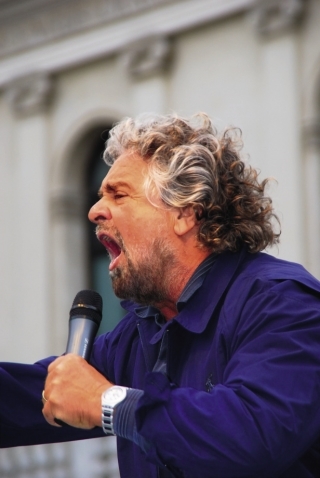 Grillo’s Five Star Movement won 25.55 per cent of the vote in February. It’s a new party and it’s the most popular party in Italy. The Five Stars are for the five ideas of: public water, sustainable mobility, development, connectivity and environmentalism. These ideas are a bit vague, but the programme is definitely left-wing. They are fighting against corruption, and they want cuts in defence spending, a minimum wage for the unemployed paid for by a tax on the rich, and more direct democracy through online discussion and voting. The Party does not have much structure (it is mostly online) and Grillo cannot enter the government himself because people who have committed a crime are not allowed to. Grillo was convicted of manslaughter in a tragic car accident in 1980. Grillo has a large ego, but he says he does not want to be a politician. The changes his party wants to make (eg. cutting all the advantages of the people in power) are promises Italians have heard before. No-one knows yet if the anti-politics of Grillo’s Five Stars will be better than the politicians before. This page was last edited on 13 May 2013, at 20:01.